In a nutshell, a body detox is a cleansing diet or fast that helps purge build-up toxins out of the body. It is practised by many cultures for centuries for the maintenance of good health or even overcoming of chronic ailments. Doctors tell us that when our natural self-cleansing mechanism is overworked, we may see symptoms such as bloating, fatigue, dark rings around the eyes, insomnia, poor digestion, constipation, stress and dull skin. A detox frees up our body from the busy regime of food indulgence and digestion by giving our detox system which comprises the digestive tract, urinary system, skin, and the liver a break so that there is chance for the body to regenerate and cleanse optimally. 1. Water fast is a rigorous exercise that helps flush out the gross waste products of digestion effectively and gets the body to work on healing, however, it requires great discipline and a strong will for the individual to sustain such a fast for a long duration. 2. If you are generally weak, have low nutritional reserves and think you will never be able to endure a pure absolute water fasting, but yet really wish to do a good body cleansing, I personally would recommend honey water fast which is less challenging, and hence more tolerable. 3. Drinking fruit juice first thing in the morning or throughout the day is a relatively easy way of eliminating toxic substances in the body while supplying a great deal of enzymes, and nutrients, calories. The most common cleansing recipe for many people is drinking a glass of lemon and honey drink with an empty stomach in the morning. (In my culture, it's very normal for people to ask for some sour juices such as sour plum, pineapple, lime and sour sop after having a big or greasy meal. 4. Alternating between juice and water fasting is another effective method of achieving body cleansing. Start with juice fasting first so that moving on with water fasting is more comfortable. The juice will give you energy for the day's activities. 5. 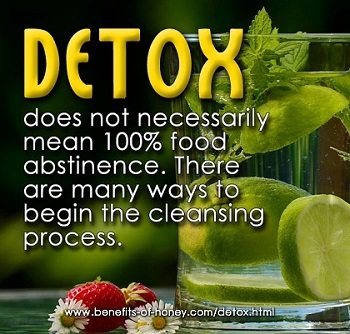 Detox does not necessarily always mean 100% food abstinence. Eating less for each meal is also good way to begin the cleansing process as the temptation to satisfy cravings for specific foods is reduced. Cutting down unhealthy snacks and junk food in your diet such as fried foods, fast food and eliminating bad habits such as excessive alcohol consumption, caffeine, refined sugar, and cigarette smoking is a form of cleansing too. 6. Turning to high-fibre diets consisting of fruit, vegetables, grains, wholesome, plant-based organic diet will also go a long way in cleansing and keeping your body strong and healthy. For example, you can have fruit for breakfast, a vegetable and nut salad for lunch, and a meal of cooked vegetables with some fruits for dinner. 7. Eating more raw food also decreases the amount of digestive enzymes your body has to produce. And raw food passes through the digestive tract faster than cooked food and gets absorbed easier so that the body can work on the regeneration of cells. You may also want to consider all-natural detox supplements that can help remove waste and toxins from your intestines and blood by utilizing the natural healing powers of herbs and fiber. 8. The more you move your body, the more you prevent congestion and clogging of the lymphatic system. Thus, doing exercises such as brisk walking, aerobics, and sports can thus assist body cleansing, whereby the pollutants are being flushed out of the lymphatic system and the cells, flooded with health-giving oxygen. Learn how to fast with honey water for three days to cleanse your body system in: Fasting With Honey. This healthy juice formula when consumed over time, is believed to be helpful in healing a plethora of sicknesses. Get this recipe in Japanese Juicing Formula for Body Detox. End of "8 Powerful Ways to Detox". Back to "Health Food Matters"